If your garden is overlooked, or your neighbours feel too close for comfort, why not consider our elegant wirework metal trellis to add privacy to your garden. Garden Requisites can supply trellis panels as stand alone panels, with posts, or wall-top panels. 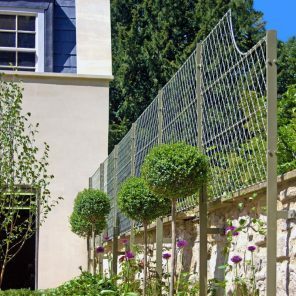 Our hand-made wirework panels are available in standard sizes or made to measure options. Call us on 01225 851577 for any help.